Department of Energy national lab researchers found strain dramatically influences low-temperature oxygen electrocatalysis on perovskite oxides, enhancing bifunctional activity essential for fuel cells and metal–air batteries. Oxygen atoms are depicted in pink, and hydrogen in blue, in oxygen reduction and evolution reactions that transfer electrons between two species and convert oxygen molecules to hydroxide ions and vice versa. Image credit: Oak Ridge National Laboratory, U.S. Dept. of Energy. Image by Ho Nyung Lee. May 27, 2016 – Catalysts make chemical reactions more likely to occur. In most cases, a catalyst that’s good at driving chemical reactions in one direction is bad at driving reactions in the opposite direction. However, a research team led by the Department of Energy’s Oak Ridge National Laboratory has created the first high-performance, two-way oxide catalyst and filed a patent application for the invention. The accomplishment is reported in the Journal of the American Chemical Society. The researchers made a thin film of transition metal oxide through heteroepitaxy, which grows one material on a substrate with different lattice spacing. The lattice mismatches introduce strain into the system. The strain changed the film’s electronic structure without altering its chemical composition, creating a catalyst better at driving chemical reactions. The discovery may guide the development of new material systems for electrochemistry. Energy storage devices, such as fuel cells and rechargeable batteries, convert chemical energy into electricity through a chemical reaction. Catalysts accelerate this process, making it more efficient. In particular, an oxygen reduction catalyst extracts electrons from oxygen molecules, while an oxygen evolution catalyst drives the reaction in the opposite direction. Catalytic reactions that proceed in both directions are required for charging and discharging of regenerative energy storage devices. “We found a catalyst that is very good at driving both the opposing oxygen evolution reaction and the oxygen reduction reaction,” said senior author Ho Nyung Lee of ORNL’s Materials Science and Technology Division. Oxide materials are workhorses of energy generation and storage. Several oxide materials contain transition metals, which can easily exchange electrons. Studies have shown that straining of oxide thin films improves their ability to conduct ions, but few studies have explored the effect of strain on catalysis in oxide thin films. The researchers studied lanthanum nickelate, an oxide system with an electronic structure that can facilitate peak catalytic performance. “It had not been known that oxides can perform as well as noble metals as bifunctional catalysts,” said Lee. He focuses on controlling orbitals, bands of electrons spinning around the nucleus that underpin interactions between atoms, to develop functional materials. 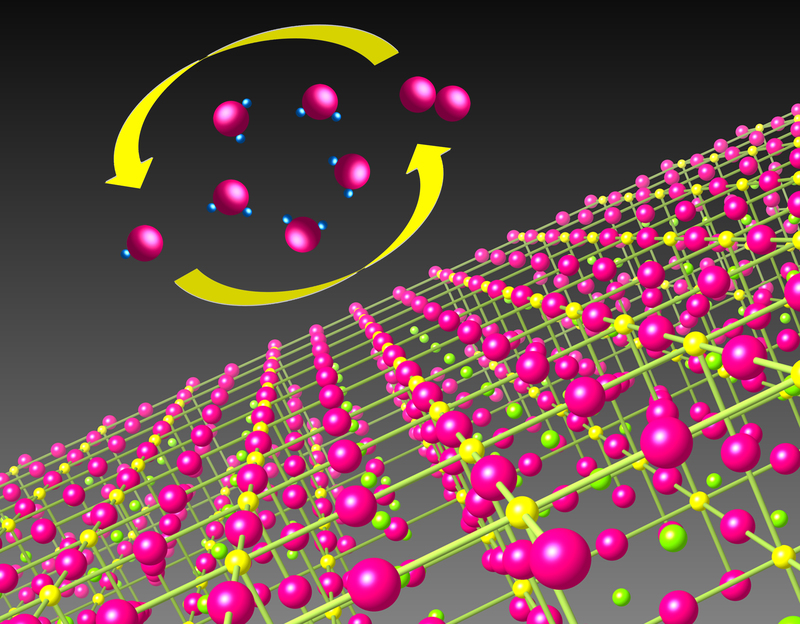 “Perovskite oxides with strongly correlated electrons are robust under harsh chemical environments and fairly inexpensive compared to noble metal catalysts.” The performance of the new catalyst was better than that of platinum, a noble metal that is known to excel at driving both oxygen evolution and reduction reactions. Though nickelates can exceed the performance of platinum in one catalytic direction, they perform poorly in the other, limiting their bifunctionality. Strain engineering in this study has enhanced their performance in both directions, fulfilling the goal of surpassing well-known catalysts such as platinum in bifunctionality. Jonathan Petrie led the epitaxial synthesis of strained oxide materials and catalytic testing, and Tricia Meyer assisted thin film deposition using a technique that employs a high-power excimer laser to vaporize material and deposit it as high-quality thin films under precisely controlled conditions. John Freeland of the Advanced Photon Source, a DOE Office of Science User Facility at Argonne National Laboratory, contributed soft X-ray absorption spectroscopy, a technique for understanding orbital structure changes, and related data analysis. Valentino Cooper of ORNL’s Materials Science and Technology Division performed theory calculations. Straining thin films controls orbital splitting—the stretching of clouds of valence electrons. “On the surface of nickelate, you have one nickel atom at the center of a square of four oxygen atoms,” Cooper said. “If you strain that square and push the oxygen atoms closer, then the nickel–oxygen bond becomes unstable. When an oxygen molecule comes in and wants to react with that surface, much less energy is needed to break the oxygen–oxygen bond in the oxygen molecule. In other words, the transition state for the reaction to proceed is lower in energy.” This new insight into how strain can be used to tune orbital splitting opens the door to developing new strategies for catalyst design and innovation. ORNL’s Laboratory Directed Research and Development Program and the DOE Office of Science supported the study. Researchers used resources at the Center for Nanophase Materials Sciences, a DOE User Facility at ORNL. The ORNL-led Fluid Interface Reactions, Structures, and Transport center, an Energy Frontier Research Center funded by the DOE Office of Science, helped characterize catalytic performance.